I've been really lax about sketching practice this year, especially life sketching. It's just been real difficult finding motivation for quite some time. I decided to try to turn that around today and spend some time this morning sketching out in nature. 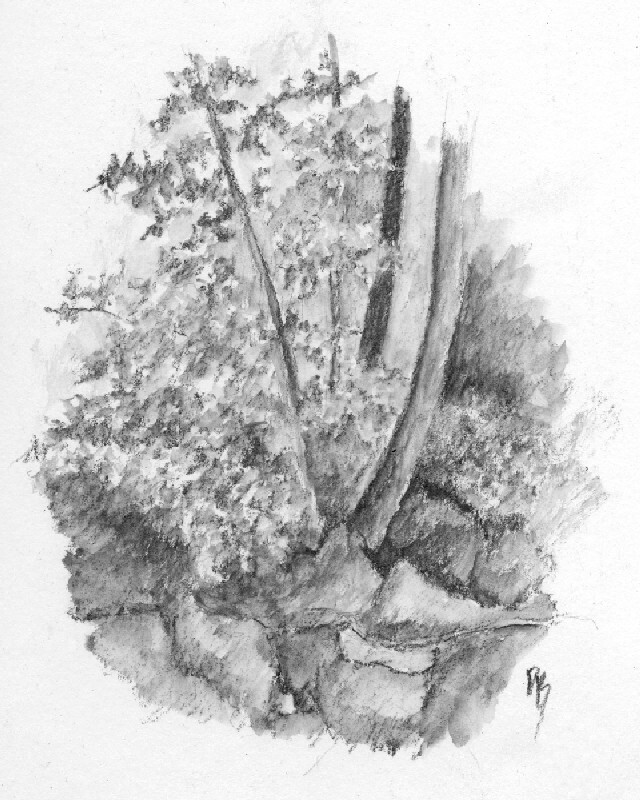 I went to Sugarhouse Park and sketched along Parley's Creek. Parley's Creek is named after an early LDS church leader, or rather the canyon that the creek flows down was named after him, it became the canyon most of the pioneers used to get down to the Salt Lake Valley, currently Interstate 80 uses it. You get a lot of densely packed nature along a creek, plants do love water, it can be difficult to organize all those values, shapes and textures. I decided to try a different tool for capturing all that value and texture quickly, General's "Sketch and Wash" water soluble graphite pencil. In combination with a water brush the Sketch and Wash pencil allowed me to draw, fill in tones and spread it all around very quickly. Even a seemingly simple little nature sketch as above can have a lot going on in it. The Sketch and Wash pencil allowed me to put in some relatively flat and smooth areas of tone along with smooth gradations, but since it's a pencil it can be used to put down line and texture very easily as well, just draw normally and don't add water, on do a dry brush only slightly modifying the pencil lines. The possibilities for tone and texture are nearly endless. I would compare the hardness of the Sketch and Wash to a 2B normal graphite pencil. Is there a downside to the Sketch and Wash? Yes there is, you have to treat it more or less like watercolor, it can't really be erased once set with water. Even before setting it with water the Sketch and Wash pencil does not erase as well as normal graphite. However, like watercolor, if an area is too dark just wet it and then use a paper towel to dap it and remove the excess graphite, or sometimes just wiping your brush and then applying again to the area is enough, however it's impossible to get all the way back to the white of the paper, so preserve those highlights! This sketch was done just a little ways upstream of the previous. 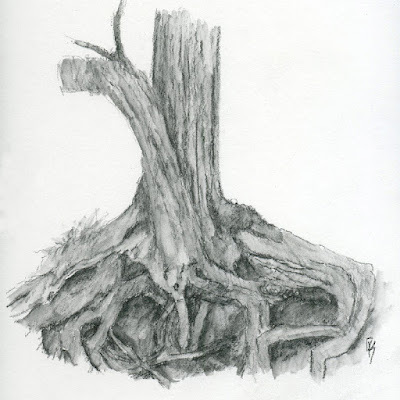 Again the Sketch and Wash pencil allowed me to quickly capture all the shapes and tones of those abstract shapes created by the tree roots. One other thing about the Sketch and Wash pencil is you can't get truly black darks with it, not even as dark as normal graphite, I knew this going in and took a Generals Carbon Sketch pencil with me which makes about the blackest blacks marks I've ever seen to supplement the Sketch and Wash however I forgot to use it! Oh well, maybe next time, and there will definitely be a next time, I think this has become one of my all time favorite sketching tools. It was really good to get out in nature today, though since it was at a public park it was more noisy that I would have liked but well worth it...until the heat got turned up then it was time to head home. It's kind of funny, it's late August and our temps are still in the 90's yet I am seeing some trees starting to turn to their fall colors, soon we'll be saying good bye to summer...sigh, I better make the most of it and get out more often with my sketchbook. My latest painting was a bit of an experimentation on a couple fronts. First, I was doing the same thing I've done with almost every painting lately, and that is pursuing the abstraction of the subject while maintaining representation. In same ways I think this painting was a gentle nudge in that direction but in other ways possibly a bit of a pull back. 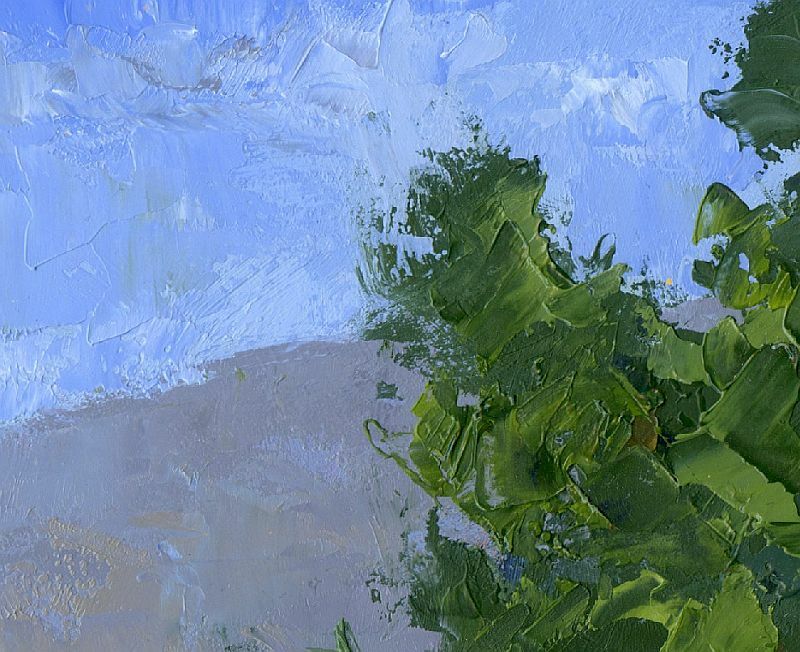 The other experimental part to this painting has to do with the title of this blog post. 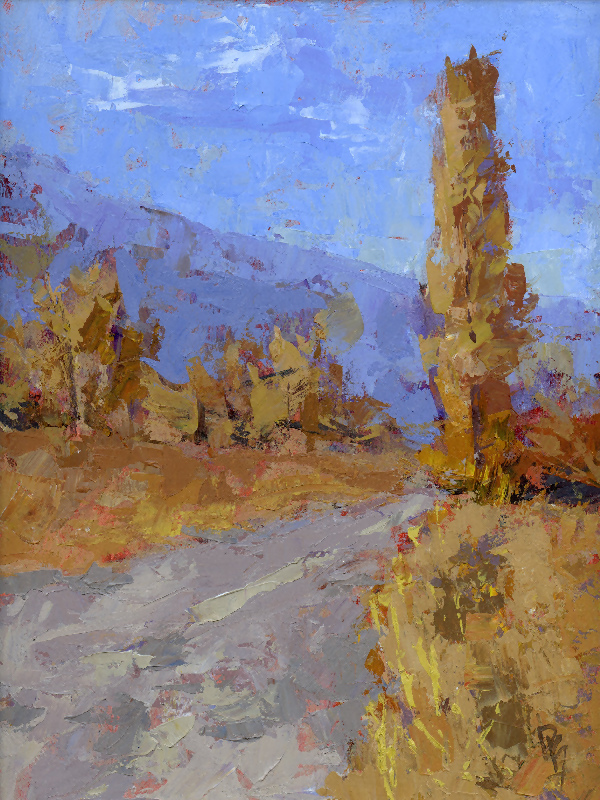 As you can see this painting has the texture of a palette knife painting, except I didn't use just palette knives to paint this autumn landscape. First I toned the panel using quinacridone burnt orange, a misting of water and a paper towel. After outlining the basic composition with a brush I massed in the painting using brushes, but starting with paint mixed with glazing medium so it went on transparently. After a few layers I started using more opaque paint until the painting was more or less blocked in, but at the same time it wasn't my intention to totally cover the surface, I like to see bits of that quinacridone poking through here and there also I didn't want the paint to get too finished before the next step. Next I got out the palette knives, however I didn't put the brushes totally aside yet. I kept one old medium size bristle brush out and used it to modify some of the palette knife strokes, in fact in some cases I applied a small pile of paint with the knife for the express purpose of hitting it with the bristle brush after. I didn't want to go crazy with this effect so I only did it a few times and then finished the painting up completely using knives. 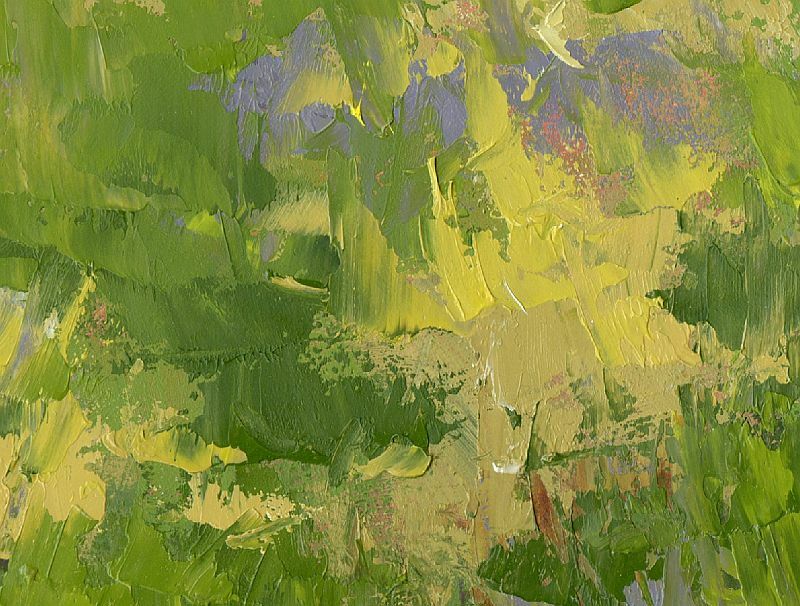 Here are a couple close up crops showing the texture, layers and the effects of using different application techniques. 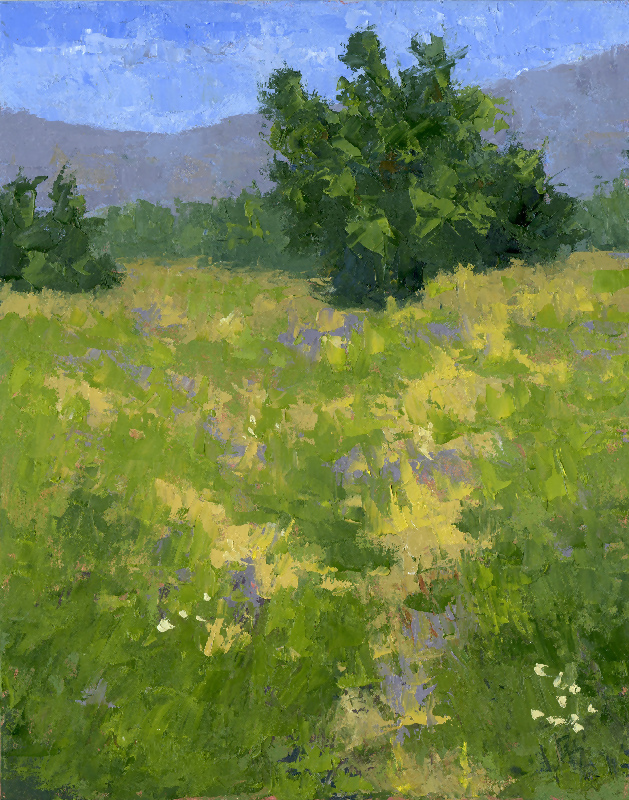 I did have a reference photo for this painting, taken somewhere in Ogden Valley, Utah I believe and it was taken during autumn but it was early in the season so had more green than I wanted and I also took some artistic liberties with the composition and shapes. 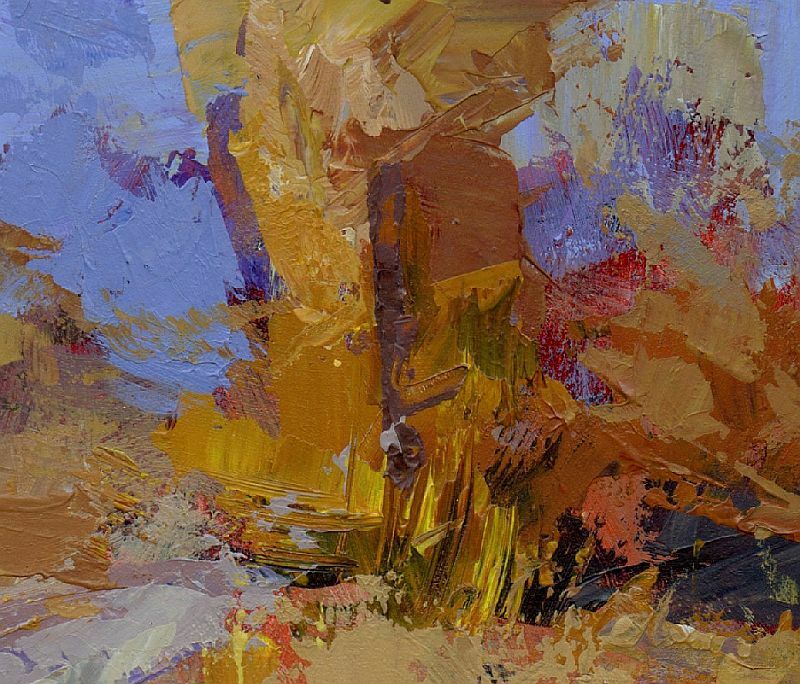 I didn't want to focus on the photo too much anyway, hard to paint abstractly while looking at a photograph. Notice I only hinted at the grass, in the photo the area to the right of the road had lots of tall grass and it's always tempting to put that in for me because I love the texture of grass, so minimizing that, only suggesting it I think helped to keep this landscape abstract. While I have been focusing on online activities, photography and digital art I haven't completely neglected the easel. In fact I recently finished an experimental painting, experimental because it was painted with oil paints and completely with a palette knife. 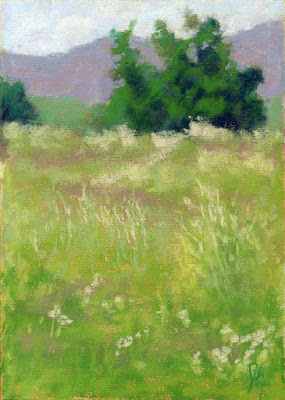 7" X 5", pastel on paper mounted to foam board. Here are a couple close up details of the oil painting showing off all that rich texture that painting with a palette knife creates. 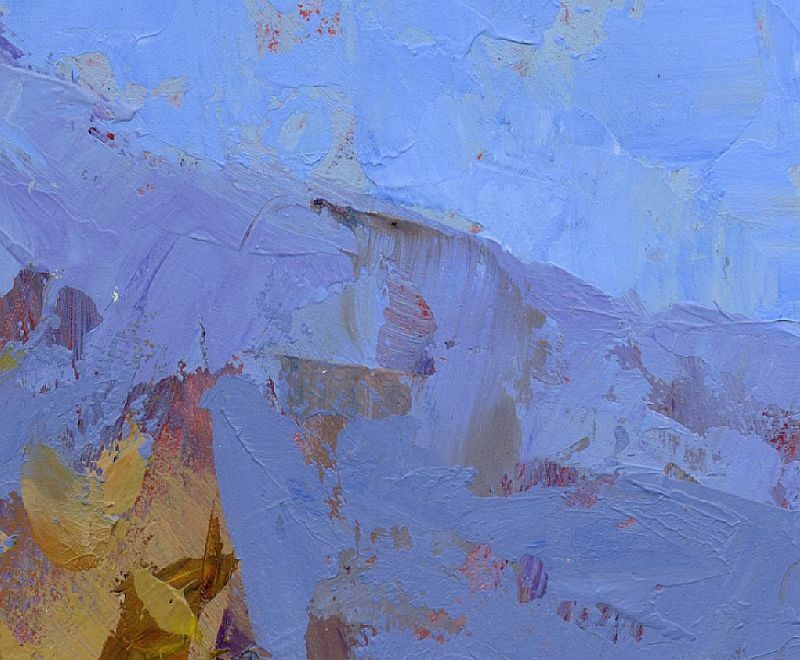 I think the painting can be as much about that texture as it is about the subject.